Insomniac is the fourth studio album from the punk rock band Green Day. It was released on October 10, 1995, through the Reprise Recordslabel. 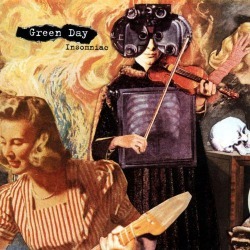 Though it reached number two in the United States and went double Platinum (According to the RIAA) by 1996, Insomniac did not have the sales endurance of its predecessor, Dookie, largely due to its slightly darker lyrical tone and heavier, more abrasive sound. The album is the band's third-best selling album behind Dookie and American Idiot with over 8 million copies sold worldwide.